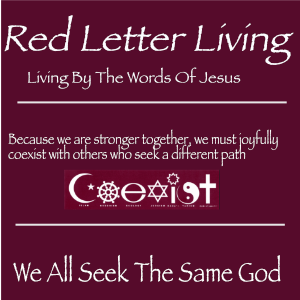 I have read most (maybe all) of your posts over at Red Letter Living as well as your various other posts on religion. I share pretty much all of your views but I must admit I long for a church. I simply cannot find one in which I am comfortable. I have never had a bad experience at church as you did. That is because I am simply silent when I disagree. But I want to feel comfortable with honest discussions. Oddly, the ones that welcome honest discussions seem to be largely political rather than spiritual. I want to follow the message of Jesus but I also want a spiritual experience. Prayer and meditation offer that on an individual basis, but wouldn’t it be wonderful to share that with fellow Christians. I continue to enjoy all your posts and especially the photographs. Thanks for the compliments Judy, it is nice to hear that I am appreciated. My wife was just so tainted by past experiences that she wants nothing to do with “church” again. I might be more open but her rejection prevents that. If I were to look again I would investigate Quaker churches in my area but they do tend to vary somewhat so one might not be same as another. Philip Gulley is one of my favorite authors and he has a church that is about 50 miles away. I would love to hear his sermons (actually I would love to hear ANYTHING, ha). Wesleyans would get my attention also as they are not fixated on the literal bible or St. Paul as most Protestants are. If everyone would just follow the “golden rule”, all of the worlds problems would just go away. But I know I’m dreaming. Simple kindness is so lacking in our world and in many instances, man’s religion is to blame.